Equity markets moved higher last week despite a variety of concerns, including Hurricane Harvey, North Korea, debt ceiling, possible government shutdown. Nasdaq +2.7%, S&P 500 Index +1.4%, Dow +0.8%. Energy, materials led sector gains; healthcare lagged despite ~8% jump in biotech stocks on news of major breakthrough/FDA approval in gene therapy, M&A news. August Employment Report showed +156k jobs added, slight uptick in unemployment to 4.4%. Both data points below estimates, but close enough to “in-line” that weaker than expected wage gain (+0.1% month over month, +2.5% year over year) should be enough to keep Fed on sidelines at next policy meeting on September 19-20. Second quarter gross domestic product (GDP) revised upward to +3.0% from +2.6% and Q1 pace of +1.2% growth. Consumer spending (+3.3%), business investment (+6.9%) beat expectations. Corporate profits +1.3% quarter over quarter vs. Q1’s -2.1% quarter over quarter. Hurricane Harvey likely detractor from Q3 GDP, though reconstruction should help boost future growth. Asian stocks extended Monday’s declines, dragged lower by Japan as yen strengthened, weighing on exporters. Tensions remained high as North Korea apparently tested a hydrogen bomb and is reportedly moving an ICBM missile in advance of its September 9 Founding Day. Calls for diplomatic resolutions escalated throughout the global community. MSCI Asia-Pacific Index -0.1%, Nikkei -0.6%, Shanghai Composite +0.1%. European stocks led higher by automakers. STOXX Europe 600 +0.4% midday. Most sovereigns lower as bund yield up to 0.38%. Euro weakened slightly to $1.18. U.K. services industry grew at slowest pace in a year last month; sector PMI fell to 53.2 from 53.8 in July. Services measures lower across the Eurozone last month. Commodities – Most dragged lower by losses in agriculture materials, precious metals. Copper +0.4%, gold +0.7% to $1339/oz. WTI crude oil +2.6% to $48.50/bbl. as >100k barrels of offshore production in the Gulf of Mexico remains offline. That number >30k when including onshore Eagle Ford output. U.S stocks open lower by 0.2%; 10-year Treasury strengthening; yield down to 2.10% as geopolitical tensions remain high. Monetary policy is not just a challenge for the Fed. The European Central Bank (ECB) meets on Thursday amid pressure to respond to improved economic data, including falling unemployment levels and rising inflation. Yet unemployment is still relatively high (9.1%), and inflation is still relatively low (+1.5%.) With the ECB’s bond-buying program scheduled to expire in December, policymakers are under pressure to unveil their plans for 2018. Some argue that the broadening economic recovery justifies winding down purchases, while others are concerned that even sending a signal that tapering is imminent will send the euro and bond yields higher, tightening financial conditions and halting the ECB’s progress. Considering these issues, and the fact that core inflation remains subdued, it is conceivable that ECB President Draghi may disappoint this week by not announcing anything, placing more emphasis on the next ECB meeting, scheduled for October 26. U.S. Treasury bonds mixed. The 10-year Treasury rallied most of last week, with its yield closing at a year-to-date low of 2.12% on Thursday. However, Friday’s stronger than expected ISM Manufacturing report, even in the face of a weaker than expected jobs report, managed to help push the 10-year yield higher to close the week at 2.15%, just one basis point (0.01%) lower on the week. The 30-year Treasury yield finished the week at 2.77%, higher by 0.02% from the beginning of the week’s 2.75%. The 2-year Treasury yield also rose 0.02% on the week, closing on Friday at 1.35%. This led the yield curve, as measured by the difference between the 10-year and 2-year Treasury yields, to flatten on the week by a slight 0.03%. Rate hike expectations lower on the week. Rate hike expectations for the Fed’s September meeting remain at zero percent, though it is expected that the Fed may announce the start of their balance sheet normalization plan at the September meeting. Markets continue to expect a slower trajectory of rate hikes than the Fed, with the Fed’s latest dot plots (from June) showing a median expectation of one additional rate hike this year, and three next year. Fed funds futures are pricing in a 42% chance of a hike in December, and are only pricing in a total of one rate hike by the end of 2018. Debt ceiling in focus. With Congress returning from their August recess, and the Treasury indicating it could run out of funding by the end of September, the debt ceiling is likely to be a hot topic in the near-term. In this week’s Bond Market Perspectives, due out later today, we take a look at what the Treasury market is saying about the potential for an extended debt ceiling debate. On the economic front, China released the last of its early September data, the Caixin services sector PMI focuses on midsize and smaller companies, which are less reliant on state-owned industries. By this measure, Chinese services had their 20th straight month of expansion, which is crucial to the government’s efforts to rebalance the economy away from exports and infrastructure spending and toward a more domestically oriented economy. Sick no more? Euro area PMI rose again last month, though slightly less than expected. More importantly, Europe has now begun its 5th year of expansion according to the indicator, beginning in July 2013. Since that time, the STOXX Europe 600 Index has increased 9.1% annually. By contrast, the S&P 500 has increased by 12.1% during the same time period. Since mid-April 2017, the STOXX 600 has begun to outperform domestic equities in dollar terms, though not in euro terms. After initially ignoring the North Korea threat, markets have shown more concern over the past several weeks. North Korea staged another nuclear test on Sunday. While no one knows where this conflict may lead, we can look back at geopolitical and military events in history for perspective. From a stock market perspective, although the latest developments may be scary, history is reassuring, as we discuss in our latest Weekly Market Commentary, due out later today. A September to remember? September is known for being the most bearish month for equities, along with one of the most volatile. As we enter September 2017, we are expecting the potential for a pickup in volatility – as there are multiple big events this month which could provide some fireworks. 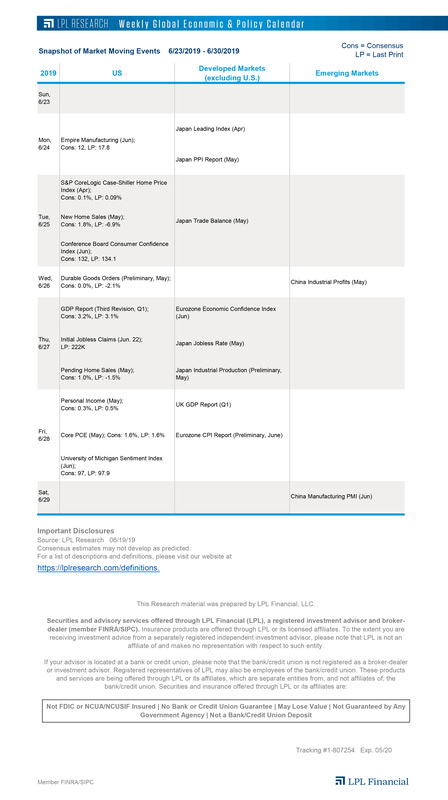 This week in our Weekly Economic Commentary we take a closer look at these events and why they are worth getting ready for.